UNDIEPUNDIT.COM: SOTU: What if we are already a SOCIALIST country? SOTU: What if we are already a SOCIALIST country? One of the most interesting lines in last night's SOTU speech was when Donald Trump declared, "The United States will never be a socialist country!" Would a Bush have ever said that? How about McCain or Romney? Certainly no Democrat would ever say that since they consider socialism the future of their party! As Republicans applauded the line, the network cameras couldn't find the fresh young face of socialism in America, Alexandria Ocasio-Cortez, though they did manage to find the red-faced scowl of old Bernie Sanders who looked like a stake had just been driven through his heart. A picture is worth a thousand Marxist dialectics. Under Barack Obama, the last administration to have a complete record, the government consumed around 70% of the private sector in the U.S. When a majority of the wealth production of an economy is dedicated to government during peacetime, that is by the modern definition... socialism. Health care is almost entirely controlled by the government, and for the poor and those over 65 on Medicare and Medicaid, where the bulk of health spending occurs, it is entirely funded by government. Virtually every mortgage in the U.S. is owned by a Government Sponsored Entity, like Fannie Mae and Freddie Mac. Every student loan since the Obama administration now comes from the government. The entire financial sector of the U.S. economy is backstopped and heavily regulated by government. Education is almost entirely funded and controlled by the government. Social Security is the largest retirement program on earth, and even private pensions are guaranteed by the government. Government is so vast and unlimited that even Donald Trump, an avowed anti-socialist, is powerless to stop these policies and programs. We have about $22 trillion in debt, and the Fed borrowed/printed another $3.5 trillion under Obama. 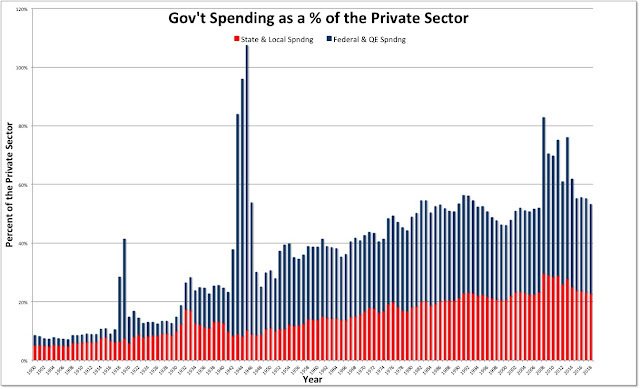 It's a total of about $25 trillion in debt funded by a private sector that runs about $13 trillion annually. If and when interest rates normalize to around 5%, which is inevitable, we will more closely resemble Venezuela than any version of the U.S. we've ever known. Sorry, I know no one wants to hear this, but we are basically a socialist country now. What Bernie Sanders and the Ocasio-Cortez Democrats are talking about is putting the finishing touches on it. They need totalitarian socialism for eternal power. Taking over the four areas not already socialized - transportation, energy, food, and communication is the next step. That's what the "Green New Deal", "Net Neutrality", "Guaranteed Income", "Guaranteed Jobs", 90% Taxes, and $15 Minimum wage will help accomplish. Add in "Medicare For All" and we are cradle to grave totalitarian socialist. Uninformed voters are always suckers for free stuff. They never understand that the cure is always worse than the disease, when the cure is socialism.